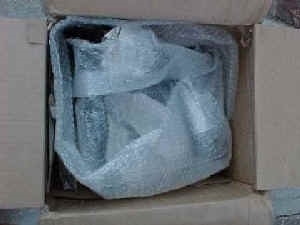 This page is dedicated to the safe packaging and arrival of items bought over the Internet. Specifically vintage mixers, blenders, and other heavy items that are accompanied by glass bowls and containers. Feel free to copy and use the information provided when contacting the seller of an item you are having shipped. These suggestions were compiled by people who collect and deal in these items. We hope this is of help to you. 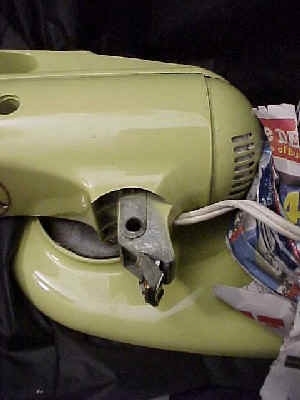 These instructions are intended as helpful hints to those sellers who do not regularly deal in Vintage Small Appliances. Your customers will appreciate the better service. 1. All objects should be immobile in the package so that they cannot shift inside of the box. 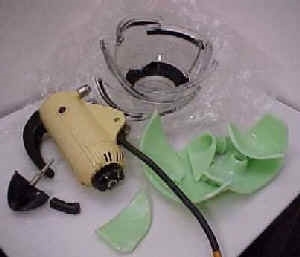 The weight of a heavy mixer can crush objects in another box when dropped. Count on the box being dropped, kicked and thrown off a loading dock. 2. All items should be totally separated from other items in the package so they cannot make contact. Even if not breakable, we do not need any additional dents, scratches or missing paint. Each item should be wrapped separately. 3. Please don't attach tape to painted surfaces. This tends to take paint with it when removed. 4. Motors should be removed from bases (if removable) and packed separately. Beaters should be removed from the mixer and packed separately. The handle should not be next to the outside of the box. 5. 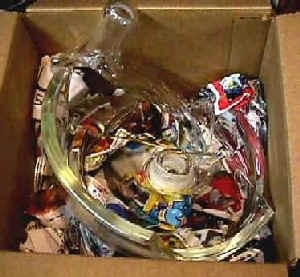 Packing glass bowls inside other glass bowls is also an invitation to disaster. If this is done, bubble wrap or use crushed newsprint so there is plenty of cushioning. Please do not just use flat sheets of paper. 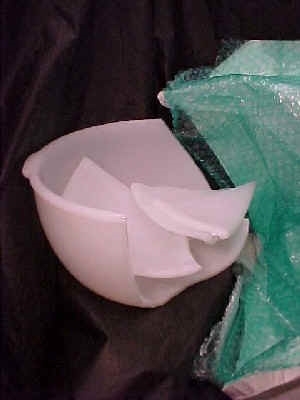 All bowls should be wrapped separately before inserting the smaller bowl in the larger bowl. If bowls are the same size DO NOT wrap together. 6. Packing materials must not move in the box. Peanuts can, and do, shift, and the mixer can move around in this material. Using foam or crushed newsprint helps keep items from moving inside the box. 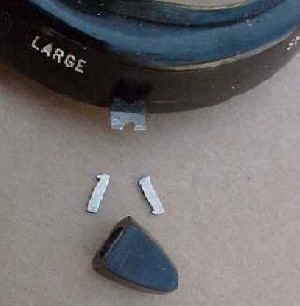 This is the biggest cause of broken bowls by inexperienced mixer sellers, the mixer moves inside of the large box and crushes the bowls even when they are in a separate box. Double boxing is of no use if the 20 pound mixer can come in contact with the bowl box. One way to prevent the movement of peanuts is to place them in plastic grocery bags, tied tightly to prevent the peanuts from getting out of the bag. 6. Bigger is better. A large box, with lots of packing that will not move, and the objects packed so that they cannot contact the outside of the box (lots of layers of packing in between) may help when the box is drop kicked by the delivery man. 8. Please remember when asked to take special precautions that the buyer has probably already received many broken items and is just trying to prevent it from happening again. If you are not willing to take these precautions then maybe you should reconsider selling items that require special packaging. These items are not stuffed animals but heavy breakables that require special treatment. 9. Remember, UPS says just because you buy insurance, does not mean the item is insured. Don't believe me just ask a clerk. The best way to keep a customer happy is spend time making sure their treasure will arrive safely. Pack it well !!! These pictures show the various problems and what happens. This box was poorly packed. Not enough packing material used and box not large enough. Mixer left on stand and bowl and beaters left on mixer also. Here is the mixer from box at left. 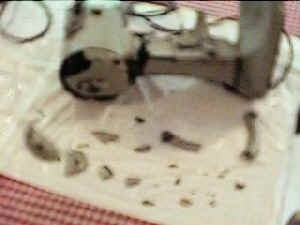 Bowl was broken, handle broken and speed dial cracked. All the packing material used is in the picture. This service is inexcusable. This bowl was shipped in a single padded envelope in the box with mixer. Gee, I can't believe it's broken. 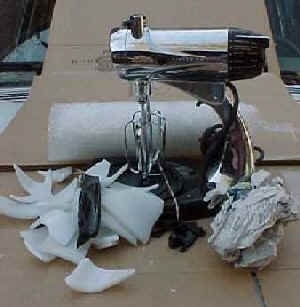 This KitchenAid mixer was shipped with motor mounted on base. When the box was dropped the metal cracked. Mixer is useless. This base was next to the outside of the box. The handle on this mixer was next to the outside of the box. This juicer bowl did not have enough packing around it. The box was too small, note how close the glass is to the side of box. There should be 2 inches of packing material between a bowl and the outside of the box.